The name of this village will be familiar to many, for RAF Honington is one of East Anglia's largest airbases. In fact, the base lies a mile or so west of the village, and the main thing that disturbs the peace here is the busy A1088, which scurries through on its way from Ixworth to Thetford. This is not a cyclists road, but you can get off it onto some of the quietest, loneliest lanes in all East Anglia. The church is off the main road, down what was once the high street, among old houses which have been carefully restored. In one of these, the poet Robert Bloomfield was born. Little-known today, his work The Farmer's Boy was a publishing sensation at the start of the 19th century. It sold more than 26,000 copies in less than three years. It is hard to imagine a poet today selling a tenth as much. There is a memorial to him inside the church. This is not a big church. Externally, it is beautiful in the way that nearby Badwell Ash is, although the tower here is 150 years older. What they both share is a beautiful porch, replete with flint flushwork and Marian iconography, completed on the eve of the Reformation. This is the devotional English Church at perhaps its highest point. But this church is a much older one than its porch, as you see as you go through the outer doors, and find the great Norman doorway. It is one of the half dozen best in all Suffolk, and similar to that at nearby Sapiston; more awe-inspiring, perhaps, although less beautiful. Inside, all is neat, bright and devotional. You might even think it a little tame and polite, after the grandeur of the porch, the mystery of the doorway. With its plastered ceilure, the grand Norman chancel arch is a rather curious thing. One could be forgiven for thinking, for a moment, that it is an 18th century classical conceit. It is interesting to compare it with less domesticated contemporaries at Eyke, Wordwell and Wissington. However, despite its domestication, Honington church retains one fabulous survival. This is the 14th century font. It has familiar tracery patterns on 7 sides, but the 8th has a heartachingly beautiful crucifixion scene. Above the cross are the sun and moon in the sky, and Mary lifts her hands imploringly, while John holds his head in despair. If this was in the V&A, people would travel from all over the world to see it. Mortlock thought that, for it to have survived, it must have been plastered over; either at the Reformation, or when the Puritans started flexing their muscles. It had been a long time since I had last visited Honington, more than eight years. As I travel around all the churches of Suffolk for a second time, the major change I am finding, apart from the fact that these days more of them are kept open, is that the Millennium was celebrated by many parishes with the installation of a stained glass window. I have said elsewhere that there seems to have been a loss of nerve among stained glass designers, and that the bold, confident designs of a couple of decades or so ago have been replaced by a certain kitschiness, a loss of nerve on the part of the commissioners, perhaps. And perhaps the Millennium Window phenomenon is partly a cause of this. Having said that, Honington's is very good, a boiling of images from the joint parish of Honington and Sapiston, including wildlife, farming on the Euston estate, the airbase, and the vicar standing outside the Norman doorway of her church. The River Blackbourne trickles through it all. Mortlock bemoans the whitewashing of the wallpaintings that Cautley saw here in the 1930s. One of them was of St Thomas of Canterbury; a rare survival, since he was violently excised by the Anglican reformers. The whitewashing was probably an expedient measure, to protect them until such a time as there was money and a will to restore them. When Cautley saw them, they were already faded. 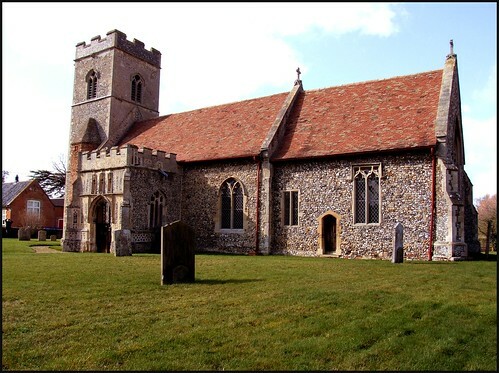 This church suffered one of Suffolk's very last destructive restorations, when all the medieval benches were removed on the eve of World War I. Some of the bench ends survived, and have been incorporated into the choir stalls in the chancel, where you'll find all manner of mythical beasts, as well as a bagpiper. They are part of the work of the same carver as at Ixworth Thorpe. Not a quarter of a mile from here, on the opposite bank of the Blackbourne, stands the similarly fine Norman church of Sapiston. However, if you are in a car, you'll need to go the long way round, about a mile. On foot or by bike, go down the little lane to the south east of the church. Ignore the sign for a ford, which you'll also find marked on the very latest OS maps. There is no ford. This river is three feet deep in the middle, believe me. Instead, use the new footbridge. And, if you are on a bike, you'd be best off leaving it at the footbridge, and coming back to it. The people who own the land between the Blackbourne river and Sapiston church have rerouted the footpath so that it goes over two five-foot lapgates, bless them.